It is usually about a third of the way into a large hedge laying job that I start wishing I'd just put up a stock fence and some barbed wire instead. As rewarding as it is to tame and regenerate an unruly mass of thorns into a living structure of beauty and function, it is a long, hard task of daily frustration and untold scratches. What keeps me going is the knowledge that the finished hedge will last for generations if well maintained, whereas the stock fence would be lucky to see out the decade. 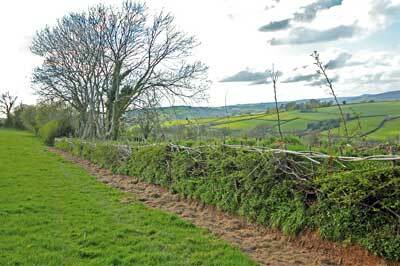 As well as longevity, it is all the extra functions of a thriving hedge that put it in a class above the fence, which is a stock barrier alone. 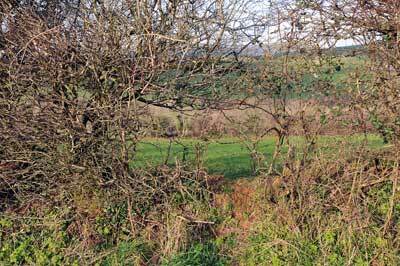 The wildlife value of hedges is well documented but they also act as windbreaks, create microclimates, are dynamic mineral accumulators, can act as run-off prevention in heavy rain and provide food in their own right. Last winter's job was my most ambitious hedge renovation project to date, but one that I'm jolly pleased with so far. I think it had been several decades since this hedge received any attention except the annual brutalising from the flail trimmer. As a result it was full of holes and the Devon bank on which it grew was collapsing on both sides. Blackthorn suckers were shooting out everywhere and the occasional hawthorns had all developed a growth habit that I can only describe as panic. I decided the best way to approach it was to lay two parallel rows about 1.2m apart and then pile the collapsed earth back into the middle to rebuild the bank. 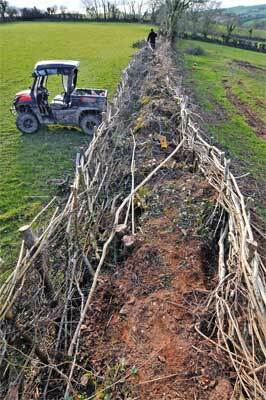 For those of you unfamiliar with the practice of hedge laying, the principle is very simple. The trees that make up a hedge are always striving to grow upwards, which means that over time a hedge trimmed at the top will develop gaps at the base around the trunks. The perfect hedging tree would be one that preferred to grow horizontally, which is what we encourage them to do with a few deft swipes of a billhook or hand axe. It can look a little brutal but the aim is to cut as much as nine-tenths through the stem or trunk, which then allows you to bend the tree into a more supine position. 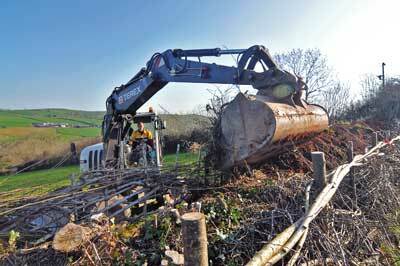 Providing the cutting is done in the dormant season, the tree will recover and grow with a renewed vigour. With this particular hedge I was working with a lot of thorn trees with diameters varying from about 12mm to over 150mm and I'm pleased to report that I think all of them have survived the process. Each region of Britain has its own style of hedge laying and the Devon way is to lay all the trees flat on the top of the bank and peg them to the floor, but because the bank on which this hedge once sat had collapsed so much, I had to import a bit of Black Country into the West Country and lay the trees Midland style. 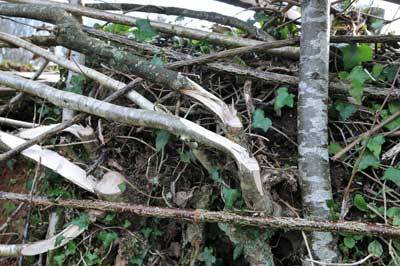 This meant laying them at an angle by weaving them between stakes banged into the ground every 400-600mm. This created enough height and strength to contain the earth on the inside and hold back the cattle on the outside. The earthing-up procedure was potentially going to be several days of back-breaking hard labour, but using the flexibility that I personally see as an important aspect of permaculture design, it was achieved in a few hours. Now, I fully appreciate that a morning with our friend, Ivor, and his 10-tonne excavator comes with a bit of a carbon footprint, but my feeling is that the best use for fossil fuel right now is to remove our future dependence on fossil fuel as quickly as possible. I think this was one of those occasions. The mother of all raised beds! Anyway, with the double hedge line filled in with soil, the whole structure ended up 1.5m high on the top side and over 2.4m tall on the bottom side - plenty high enough to stop even the most athletic livestock. What we had effectively created was not only a sort of thorny wall, but also the mother of all raised beds. So, along the centre of the bank I went on to plant a row of black locust and various fruit trees, which should root into the bank and stabilise the soil whilst hopefully producing fruit safely beyond the reach of the cattle. The only thing left to do before taking the 'job done' photo was to cover the bare soil from the excavations with old hay from our barn. Nature hates bare soil and the hay provides grass seeds, fertiliser and mulch all in one. Spring has been a bit late this year but Iâ€™m pleased to see that the newly laid hedge is greening up much faster than our other hedges. This I can only assume is because the earth bank is now acting as a south facing thermal store and transferring the heat slowly back to the hedge plants. The fruit trees are blossoming well now and I'm already looking forward to ambling along our new 'fruit rampart' later in the year and picking apples, plums, pears and cherries as well as the more traditional hedgerow fruits. If this article interested you, have a look at this book, published by Permanent Publications, which is available to buy for a special price of £29.95 (reduced from £39.95) at www.green-shopping.co.uk. 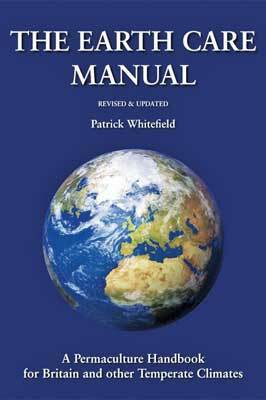 In it, Patrick Whitefield offers a vision of a sustainable future and the practical steps we can take towards it.